Imagine getting your hands on specs, samples and marketing materials for your competitor's most interesting line of future products. That's what will happen under the terms of a judge's ruling last week in Apple's patent infringement lawsuit against Samsung. Without commenting on whether Apple's claim that Samsung ripped off iPhone and iPad design in its Galaxy tablet and Infuse phone product lines, U.S. District Court Judge Lucy Koh ordered Samsung to turn over the Android tablet and other products for a look. Koh's order calls for "limited expedited discovery" within the next 30 days, three months ahead of a typical discovery schedule, according to Courthouse News Service. · No huge surprises are in store for Apple, since review copies and photos of some of the products have been kicking around for weeks, if not months. 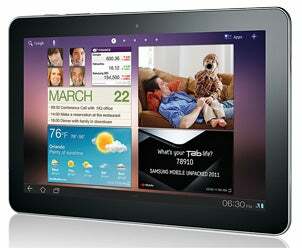 In her ruling, Koh noted that Samsung handed out 5,000 samples of its Galaxy Tab 10.1 on May 10. · Samsung will have to provide Apple with product samples, packaging, package inserts and manuals for the Galaxy S2, Galaxy Tab 8.9, Galaxy Tab 10.1, Infuse 4G and 4G LTE or "Droid Charge." · Koh denied Apple's request to depose Samsung executives about all five products in the same 30-day timeframe, calling the request too burdensome. "The Court is also sensitive to Samsung's argument that production of samples of unreleased products to its competitor would be prejudicial," said Koh. "The Court notes, however, that this argument is undermined to some extent by evidence that Samsung has already released images and samples of its forthcoming products to the media and members of the public." Samsung's four countersuits were mentioned only briefly and only Apple's outside counsel will get to peek at the Samsung goodies. Apple insiders won't have access - unless someone leaves one of the prototypes in a bar.